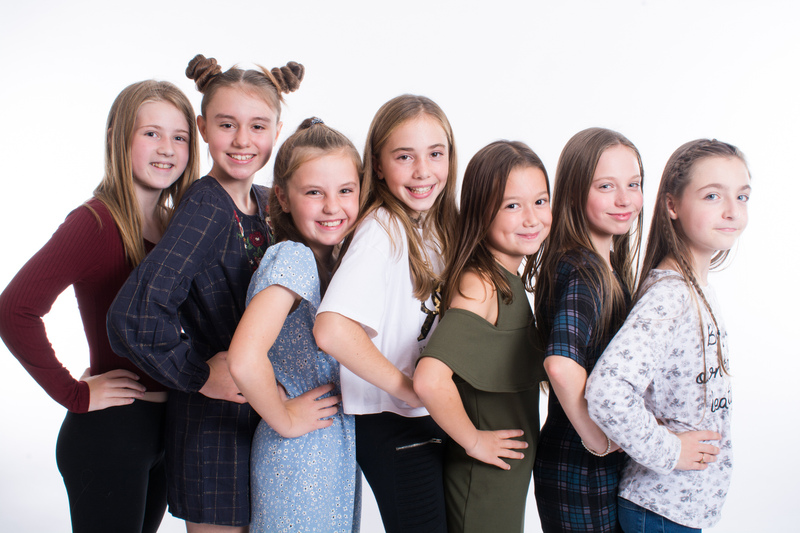 Photoshoot parties have become really popular over the last few years and I have ended loving doing them! I set up my studio with lights and backdrop and the space I use for the party has a bar area that is great for serving food to the hungry models . There is a also a dressing room area upstairs for them too where they can giggle and change their outfits. Its works really well with 3 outfit changes. If the guests all arrive in their party wear then it’s great for doing the first set of pictures and after this, while they are still looking all glamourous I do their individual portraits. Over the years the most popular outfit has to have been the onesie! 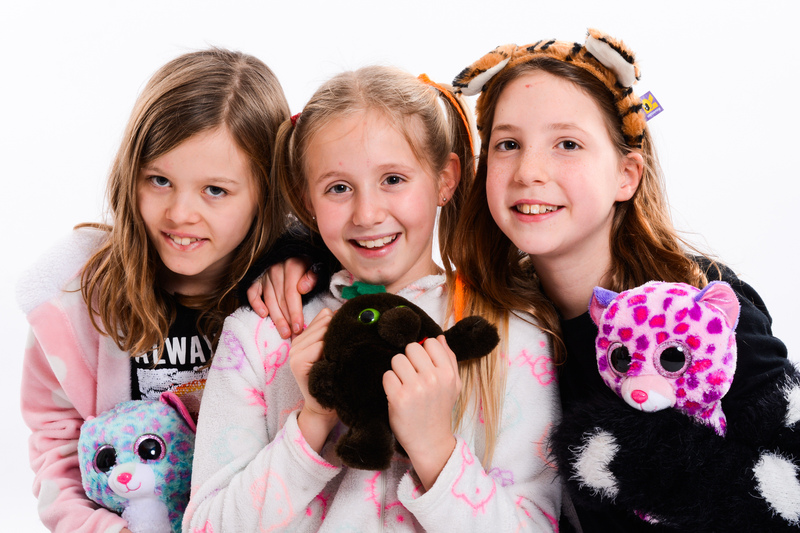 The girls all love it and bring their favourite teddies usually too! 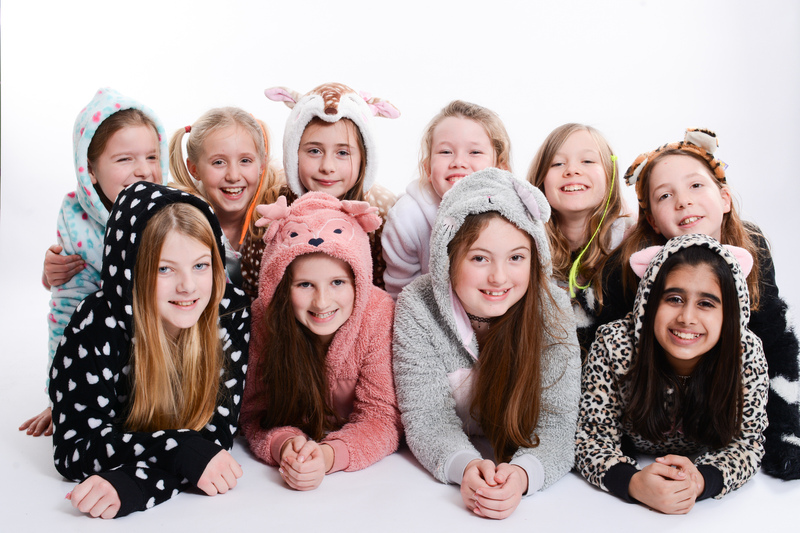 We have also done sportswear, jeans and hoodies as well as St Trinnians outfits. However you want to do it is fine by me! I have a large selection of props that the guests can use to add a bit more pizzazz to the session, it gives that ‘Photo- booth’ feel that they all just love! For children that are moving on to Secondary School this has been a brilliant idea for a party as the birthday girl receives a USB of all the images and the guests receive a portrait and group shot print each. 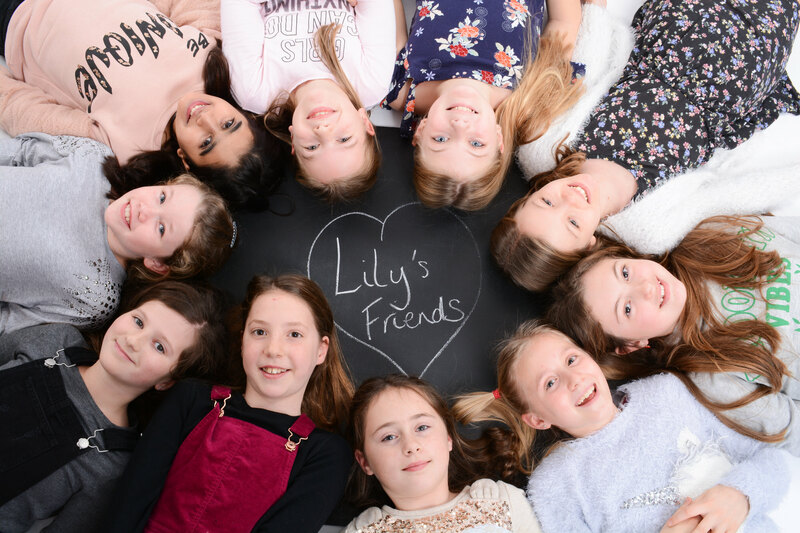 It can be very interesting accommodating the extroverts and introverts in a friendship group, I have found that it’s often not who you think that is relaxed in front of the camera, and certainly always surprising who the photogenic ones are! The parents can just sit and relax! I will do all the work for you! You just need to provide food if you wish to or a birthday cake and then sit down on the sofa and enjoy the atmosphere. 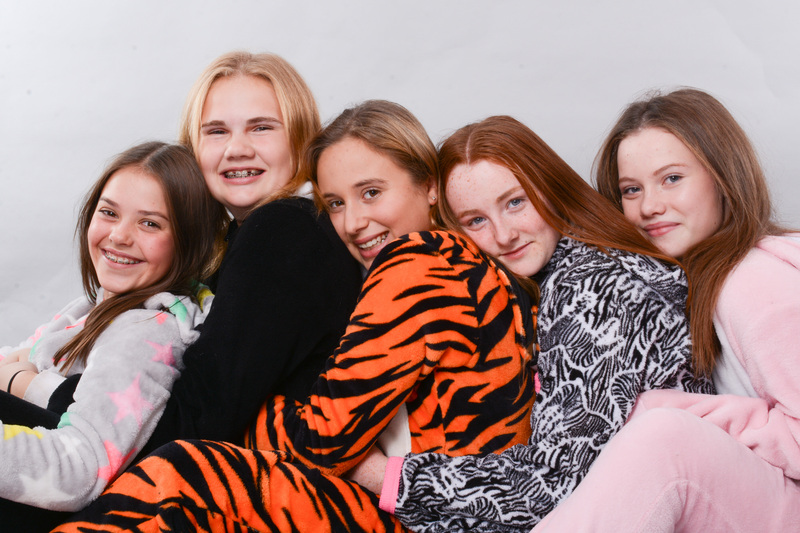 These parties can be for any age, although they have been very popular with young teenage girls, it could just as easily be a hen party or celebrating someone that is emigrating! Why not get in touch to discuss your special occasion? 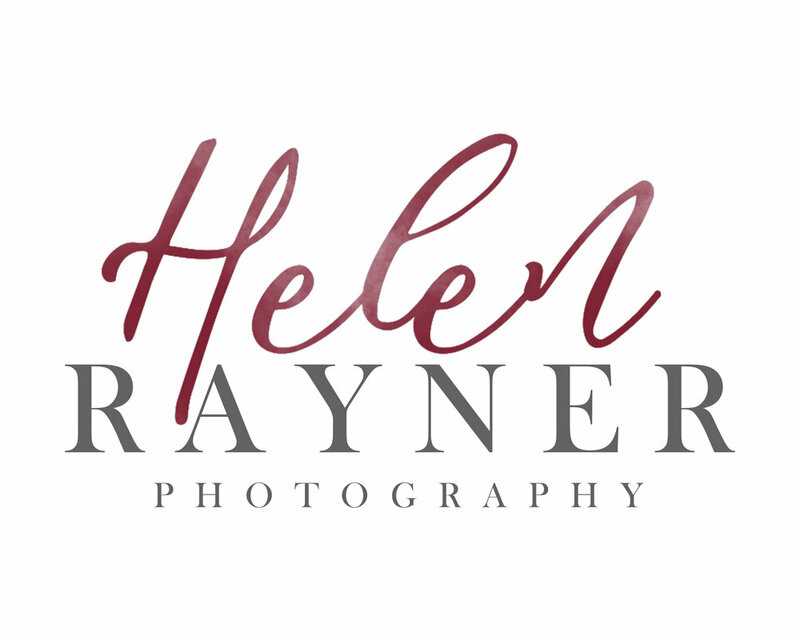 I can tailor it exactly to your needs and give you a very memorable party along with some great photographs for you all to look back on and smile.